You can easily find lots of information on what you should do with e-learning courses. Heck, I write about these sorts of topics myself right here on this blog! What about the pitfalls and mistakes that businesses make when creating e-learning courses? 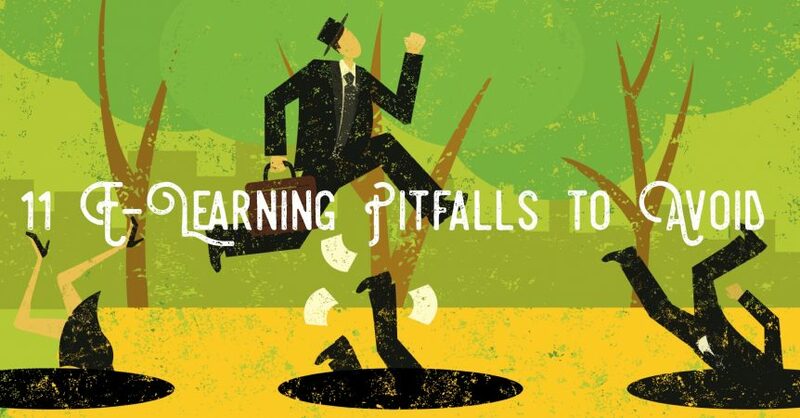 Below you will find the 11 most common e-learning pitfalls you should avoid. A good e-learning provider will help you keep away from these mistakes, although many of them are ultimately up to you. After all, your e-learning provider can’t force you to do something you don’t want to. So, it’s best you know and understand what the common pitfalls are. There is no point creating an e-learning course if you don’t have a clear objective in mind. This could be to upskill your employees, improve performance in a specific area of your business, or something else. The important thing to remember is you must understand this objective and you must communicate it properly to the e-learning course creator. Senior management in the company, including, in many cases, business owners and company executives, must be included in the process of creating an e-learning course. This could be as minimal as informing them about what you are doing and the objectives you will achieve. If you don’t do this, you risk them coming to a conclusion from a position of ignorance and thinking the course is a waste of time and money. One of the great benefits of e-learning courses is the interactivity you can include. This interactivity means learners don’t have to be passive participants. In fact, you will get better results from the course when you include interactive elements. Often these elements are not included because they take skills and experience to produce, something which many companies don’t have in-house. As a result, you should always use a professional e-learning course provider to ensure your e-learning courses are interactive. E-learning facilitates user-controlled learning better than any other learning delivery method. You should, therefore, give learners this control. By doing so, you will increase their enthusiasm for the course and will encourage them to complete it. Overall, they will have a better learning experience. Clients often ask for filler content to be added to white spaces in e-learning course drafts. This could be additional images or other similarly superfluous content. When you work with a professional e-learning course creator, though, white spaces don’t appear because of a lack of content or because the designer couldn’t think of anything to fill the space. White space is essential to keep the course clutter-free and to enhance the experience of the learner. Almost all e-learning courses require text. The way you present that text is important to the experience of the learner. In other words, you must make the text as easy to read as possible. One of the best ways of achieving this is by not including long paragraphs or large blocks of text. Instead, you should present the text in short paragraphs and use bullet point lists as much as possible. Mobile devices are the technology of choice for many learners. To make it as easy as possible for them to complete your e-learning course, you should ensure it works on mobile devices. In most cases, you can achieve this by using a responsive design. Creating a course and then releasing it without any testing is a recipe for disaster. You should test internally first to identify problems, but you should also test with real users. This could mean, for example, releasing the course to a small group of learners who are aware they are the first to go through the course. The best e-learning courses are those that are dynamic. This means changing the content, design, navigation, or other elements based on learner data, learner feedback, new information, updated information, and more. By remaining flexible and accepting this need to change, your e-learning course will improve over time. In addition, it will be easier to keep it up-to-date. Following on from the last point, you can learn a lot about the success of a course by reviewing learner data. Are there sections where learners score consistently low on in-course questionnaires? Are there bottlenecks in course progression, i.e. points at which learner progress starts to slow? Learner data will tell you this and more to help you improve this course and other courses you create in the future. Learner data is not the only feedback you should get about your e-learning courses – you should also ask learners to give you feedback directly. This real-life experience of going through the course will give you invaluable information to use in the future. With planning, knowledge of how people learn, and sufficient experience of creating e-learning courses, you can avoid all these pitfalls. The end result will be better courses, improved learner experiences, and maximised return on investment.